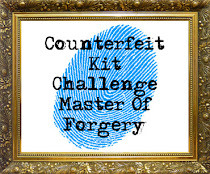 Welcome, once again, to the Counterfeit Kit Challenge Reveal Blog Hop. Our counterfeiting journey begins over at the CKC blog here and if you've been hopping in order you should have arrived here via Leslie's blog with the Magic Blue Box. A warm welcome to Stacy, our talented guest designer this month. I was immediately drawn in to the various shades of blue that made me think of well-worn denim and soft chambray. Let's head over to the clothesline to see what's hanging out today! My all-time favorite denim paper by Basic Grey had to make the cut, as well as those light blue Scrabble tile Thickers. Some floral paper by Maggie Holmes adds that feminine touch needed to make our soiree complete. While not multi-color like in the inspiration, the solid wood-tone ruler paper steps in as a close second. And, I adore that multi-patterned/mulit-colored alpha sheet by October Afternoon. Such a feminine feel! What's that? You'd like a closer look in the basket? Sure thing! I just cut some fresh wildflowers before hanging out the laundry. There may be a few scrap goodies in there, as well. I can not tell a lie. The Lucky Charm 6x6 Paper Pad was purchased with this kit in mind. I don't usually do that as we are supposed to be using up stash, but it was calling my name! I was shopping at TJ Maxx (a discount store where you can often find scrappy supplies at rock bottom prices) and when I saw the colors and patterns of that paper pad, I just HAD to buy it. Good news, though...it was only $2.99! More of the tiny type letters are a MUST for my kits these days. Pink adds the perfect pop against the blue. Next let's zero in on the printer's tray full of yummy embellishments. I really enjoy using this tray to keep all of my kit pieces sorted each month. This was also another TJ Maxx find on clearance. My chipboard bicycle mimics the metal paper clip style ones in the kit. I briefly thought about bending some paper clips to try and make a bike, but thought, "ummm...NO! I not THAT much of a Master Forger!" This Basic Grey chippie works for me! Film strip pieces and those cobalt blue gems also work well as copies of those in the kit. I followed the color palette for the solid cardstock exactly and then added some denim textured papers by Authentique. The B sides are just as gorgeous as the A's so I can't say for sure what you will see in my layouts to come. Attached to the bottom are 2 of the Lucky Charm papers that just really matched the inspiration nicely. Well, now that my laundry is dry and smelling fresh from the outdoor breezes, it is time to bring it in...along with my scrap supplies. Let's get scrapping (and folding...UGH!). Be sure to hop along to Millisa next who will share her take on this month's Cocoa Daisy kit. The complete list for the hop is listed below. Lynnette http://sassyscrapper2010.blogspot.com/ YOU ARE HERE! LOAD in Vogue Blog Hop! Welcome to the LOAD in Vogue blog hop! I hate to be all exclusive, but if you're not part of the ScrapHappy community, this one's not for you. Sorry! Membership does have its privileges, but we would love for you to be part of the fun, too. Check out Lain's site here on how you can join this wonderful community. 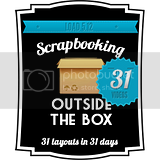 We are gearing up for our October Layout A Day Challenge, Load in Vogue, a scrapbooking journey through the decades. Here we will explore trends, fads and fashion as sources of inspiration. 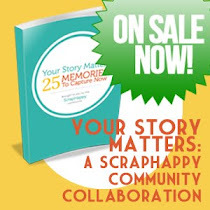 Many of your fellow ScrapHappy sisters have volunteered to offer you some advice and encouragement through this blog hop. I'm the first stop on the list and then be sure to stop by and visit with the others. Leave us some love, too! It's good practice for commenting during LOAD. So, sit back and relax and enjoy this LOAD pep rally of sorts. It is sure to get you ready for a fun-filled month of scrapping. So, many of us have been around the pre-LOAD blog hop block before. We know about getting lots of adhesive, putting a kit or 2 together, printing off photos, getting some crock pot meals lined up. So, I thought I would go ahead and take a different approach this time around. Today I'm going to walk you through some actual experiences I've had during previous LOADs where I read a prompt and said, "HUH?!" and how I handled it. This will probably happen to possibly all of us sometime during the month. Before you freak out, take a deep breath and try to relax. Here are some strategies to help you get the juices flowing. 1. Use the photo in the prompt as inspiration. I know that seems like stating the obvious, but even just jotting down a few words or phrases that come to mind when you look at the photo may help you find your angle. Is there a way you can connect a personal experience to the subject? on pinterest for hidden elements, I also immediately knew the story I would tell. I'm not one for doing my son's schoolwork, but he is an excellent speller and he despises these word searches. He makes EVERYONE miserable, so I sort of help him along to put everyone out of misery. Thought this was a fun and unlikely story to tell...all from that silly prompt! 3. Talk to someone about the prompt. It doesn't matter if they are scrappy or not. During LOAD513, Lain prompted us to be inspired by a "red herring". I honestly didn't even know that term. My husband explained to me what it meant, but that still didn't make the light bulb go on. Then he mentioned that the hosts of our favorite radio show, "Car Talk" often mention the term "red herring" during the puzzler portion of the show. I hadn't remembered that. Oh yeah! Now the wheels were turning. My page in the end had nothing directly to do with "red herring" and it didn't even mention it on my page, but I did make a meaningful page about our favorite talk radio show...a story that would probably have never been told had it not been for this prompt. Taken from flickr description: At first it may seem that I went off prompt, but this is completely inspired by red herring. I wasn't sure how I was going to approach the prompt, so I started talking to my hubby. He then reminded me of this radio show that we like to listen to and how they often talk about a red herring in their "Puzzler" portion of the show. We (as a whole family) enjoy listening, even though my husband is the only one who is into cars. These guys are so entertaining...it doesn't even matter. It is a great and very unlikely topic to scrapbook, but really part of our Saturday mornings. 4. Stretch and twist the prompt to work for you. Also during LOAD513, Lain stumped me again. We were to scrap a page about lust (in the sense of something you reeeeaaallly want). I read it and had nothing. I could not, for the life of me, think of something I wanted so badly that I would make a scrapbook page about it. I just wasn't feeling it. I thought all day and was nearing the time I had to make a decision and scrap. Finally, I decided to change lust to luster. I had been wanting to scrap a page about the story of my wedding ring and luster is a word that is used to describe diamonds. BINGO! Is this anything close to the original prompt? Not at all, but it doesn't matter! My page. My stories. My scrapbook. Taken from my flickr description: I used the actual word lust as a starting point and changed it to luster, as in shininess. My Dad passed when I was 6 and my Mother re-married, so before I got engaged she gave me the ring my father gave to her to have the diamonds re-set. So the title doesn't mean that I REALLY wanted my mother's ring, but I am sure glad that I have it. 5. Cut your losses and move on. Sometimes you don't have time to google, pin, talk and stretch. Sometimes you just need to crank out a page and be done. And you know what? That's okay! Really. No one will be offended. Scrap something easy and light and move on. Taken from my flickr description: Off prompt and working late tonight after helping my DS with a heritage day project all day long. Used a technique Monica shared in the washi tape webinar. This one is clean and simple. Taken from my flickr description: I had given up on the LOAD prompt as I didn't think I had anything, and moved on to the prompt over at Whimsical Musings. Pam challenged us to scrap about being late. After finishing this page...I think I did satisfy both prompts. The question of why would be to my mother: "Why is being on time being late?" She was definitely an early bird! We strongly encourage you to follow the prompt when you can, but understand when you can't. Some days you will read it and know exactly how to approach it and others will take a bit more work. Please don't curse at us if some of them stump you! :) It is when you stretch those creative muscles that you become a stronger and more confident scrapper. Sometimes, it is that extra effort that yields the most inspiring and meaningful pages. Anyway...welcome! I have a quick post to share with you today. I've been busy, busy, busy with scrappy deadlines, but wanted to take part in this hop to show you a creation from my September Kit, "Spa Retreat". If you don't remember, this kit is all about peace and serenity and what could be more serene than BUTTERFLIES? As it states in the journaling, the butterflies just about posed for the camera during this photo shoot. I used this sketch from "Page Maps" that I found on the Scrapbook & Cards Today's facebook page. I've been finding this to be a great resource for inspiration. I followed the foundation pretty closely and then spread my wings and made it my own in the end. I thought a little bit of tulle was a good nod to a butterfly net. I wanted to include a pop of yellow to tie in to the butterfly's wings. The only yellow letter stickers I had were pretty used up. I determined my title based on the letters I had on hand. Perfect way to use up those rag-tag letter stickers. Not much to say here, but this little tag (thanks Leslie) fits the bill. A little bit of ripping, distressing and tying up makes this photo complete. And that is all for today! I'd love to sit and chat for a while, but Julie is waiting for you. I'm sure she has something fabulous to share! Thanks for stopping by! Do come back soon! What's this? A non-scrapbook related blog post? I didn't even know there was such a thing! Zoot, Rob's '69 Autostick VW Bug, had the opportunity to get out of the garage and hang with some of his other Volkswagen friends. Rob came along for the ride, too. Check out the brake light on this '50 Bug! In case you don't know the red light means STOP! Rob used to worry that his car wasn't "good enough" to bring to a show. The reality is that enthusiasts just love to see these old cars and busses (in this case) out there at shows. Here's an example of "it doesn't have to be perfect to be good" on a VW Bus. The rust sort of give it charm, I think. This sticker made me chuckle! After attending these shows with Rob after so many years, a girl can only look at so many spark plugs and rusty deck lids. These Skotch Coolers seem to be a popular prop to have in your VW and I just fell in love with that retro looking plaid. We've picked up several over the years and I really admire the collection here. Cool camper bus, too! This one was actually a GRILL! I've never seen THAT before! How about this adorable picnic table? It is hinged and the legs unscrew. It folds up like a briefcase! With my scrapbook expo coming up next week, I couldn't justify spending $50 on it, but boy, do I like it. Now THIS just takes the whole chalkboard art trend to a new level! The owner had out a box of chalk for you to add your artwork to the bus. Gracie and I had fun with that. Even a shout out to our Savior! These old VWs sure do get around! I especially enjoy looking at all the VW Camper Vans. It's like looking into a little dollhouse as they are furnished with curtains and cool upholstery. Some even have little sinks and stoves and booth-like table seating. Someday, we are going to fly to California and rent one of these. I'm not saying we will camp for our whole trip, but a few nights would be a cool experience. We are so fortunate to have such an awesome show right in our own backyard. I may not understand all the in's and out's of a VW engine or which Bug is a '69 or a '72, but I love supporting Rob in his passion. A quick post to show you some of my creations. I've been busy in my scraproom using up supplies and creating. That's a really good feeling! First, we have a layout featuring 100 Enamel Dots! This was for the 100th Prompt Celebration over at Whimsical Musings. These dots are a DIY variety that I tried out a few months ago. Check out the tutorial here for all the info. The real deal ones are way too expensive to put that many on a page. I like the mosaic feel they create on the doily. Next, we have a photo that I just adore. No journaling needed on this one. I had included this background paper in my kit intending to use the OPPOSITE side. The colors and surfboards were just too perfect to pass up. A quick trip up to the kitchen to my bar supply stash (which gets more scrappy use than it does for mixing up drinks) for a little umbrella and this sweet layout is done. Life sure is good. Can't have a turquoise based kit and not have some beach photos, in my opinion. I was almost to the point of hoarding those little chipboard hexagons, but I'm glad I got over that and put them on this page. I will never tire of that shape and the way you can build a little cascade with them. While not turquoise, the papers below did indeed come from my September Kit, "Spa Retreat". The inspiration kit included the 6x6 paper pad, "Pier" by Crate Paper and since I own that, it made the cut for my kit. I used up the whole pack of those wooden banners and got crafty to make the end of the package of Thickers work for me. Yeah...stash busting!! Last one for today is another Whimsical Musings prompt. Actually, it is a two-fer. Favorite summer beverage and using flair. Love that I finally used at least some of that Hambly transparency! Finally got my hands on some sequins as I think they add a lot of effervescence to the page! So, that's all for now. It's only mid-month and I still have lots of kit left. I'll be back to share some more of my creations soon. Thanks for stopping by! Our first challenge over at the Counterfeit Kit Challenge was to complete a started project. My project hasn't been hanging around in limbo for too long, but this challenge was the perfect push to git 'er done before I lost my enthusiasm for it. Last month I was "partying" over at the Whimsical Musings Challenge blog. My good friend and fellow CKC Design Team member, Lisa is celebrating 100 inspiring and creative prompts. Cathy, one of the guest designers, challenged us to make a list of our top 100 of anything we'd like. She even said we could scrap just the top 1, if a list of 100 seemed too daunting. I immediately thought of a top 100 song list, but as song names raced through my head, I was starting to feel a bit overwhelmed. How would I rank them? Would it include old songs AND new songs? What would the design of the layout look like? And that's when my brain shut down. It was too much to figure out in the midst of summer fun with the kids. But, I really liked the idea of documenting my love of music. Then I thought of a way to make the project more manageable. I decided to break my Top 100 list into (10) Top Ten lists based on different categories. So, with a category jotted down on the top of individual notebook pages with 1-10 written down the side, I started brainstorming. Some songs came back to me immediately, while others required me to look over my itunes playlist or google Top 100 lists from specific years. I completed this in small chunks in between other household tasks. I didn't worry about ranking them as that could really slow the process down and this project would NEVER get completed. This process took a few weeks, and had it not been for this CKC prompt, I may not have had the push to follow through completion. As for the design, I couldn't picture a list of 100 song titles on a 12x12 paper. I wasn't quite sure how photos (and did I even have anything appropriate?) would fit onto the page. A mini book may be the better way to go and that's when I noticed my August kit, "Office Max" and all of the Simple Stories project life style cards sitting around. The little cards (and I had lots of them) are the perfect size for a list of 10. I rummaged through and found ones that didn't have a complete graphic over them and then used the coordinating sticker sheet to make a few extra that would have room for a list. The ones with graphics made good filler pages and the foundation for a front and back cover. Hole punched and ringed and here you have a mini book detailing my top 100 songs. I altered the "Keep Calm" and "Do Something" cards to match my music themed book. Are you up for a list of your Top 100? You can see here that it IS possible if you break it up into smaller bites. Or, simply scrap your top 1. Check out Cathy's prompt here as the celebration over at Whimsical Musings continues for a few more weeks. Lisa has some great prizes up for grabs and you have the opportunity to document some cool facts about your life.